I am thrilled to be a Bostik blogger for another year and my first craft post for 2018 is a little bit different. Below you will find a photo tutorial for making a Valentine’s Day card from leftover or broken wax crayons. We have a huge box of colouring crayons in our house and many get broken or used to the point that the pieces are too small. You can use these pieces to make pretty melted effects or melt and re-mould them into shapes. 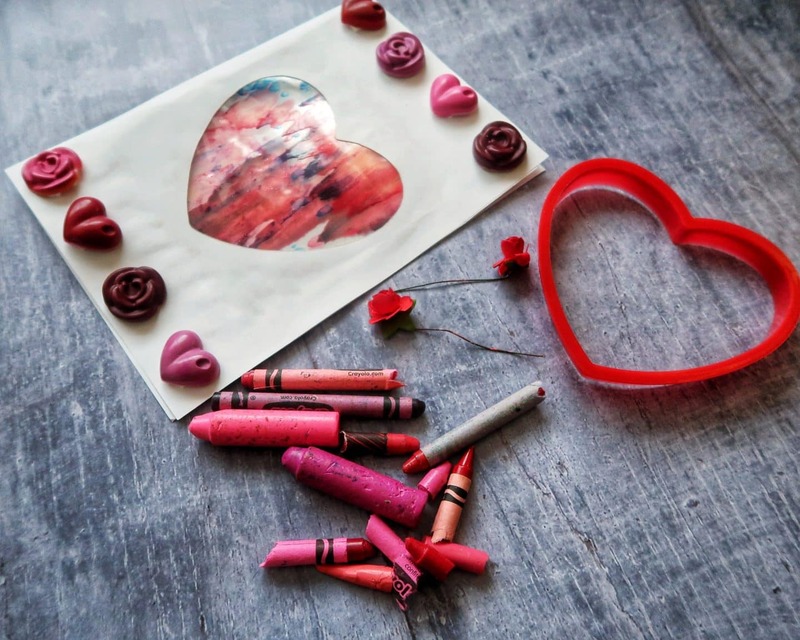 Although I chose pink and red crayons for this crayon Valentine’s Day Card craft, you could easily use other colours and adapt the craft for other seasons and holidays. You can find the text instructions reproduced below the image tutorial. To create the colourful window, grate broken crayons inside a laminating pouch. Take care to stay away from the edges. Next, close the pouch and place on top of a tea towel on an ironing board. Add another tea towel on top and carefully iron on high heat for 2 minutes/ until pouch is firm and set. 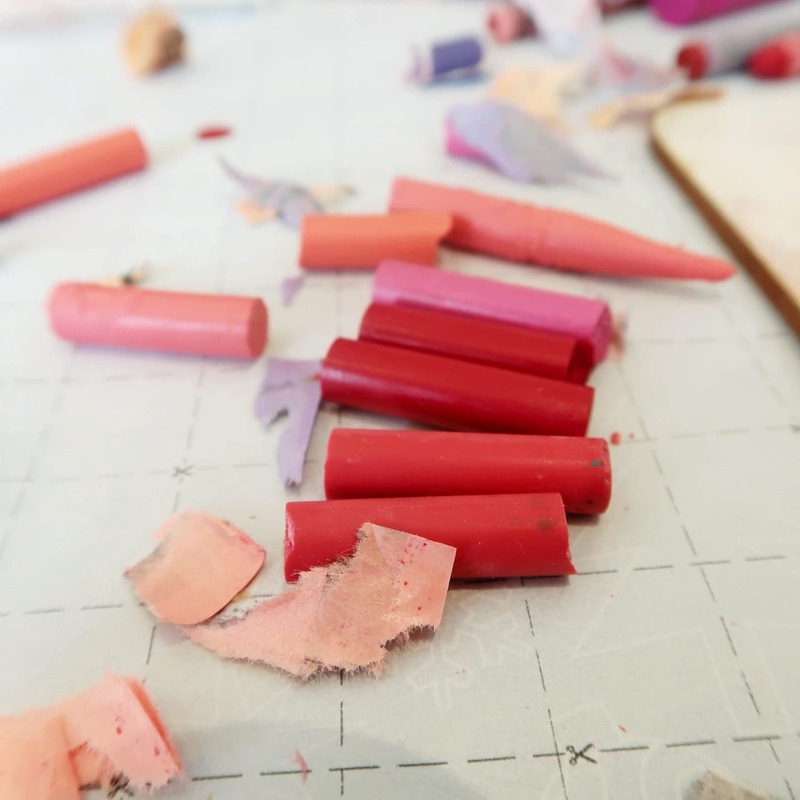 Place any extra broken wax crayons into the silicone mould. Heat in an oven at 200 ° for 10 minutes. L.eave to cool. remove carefully. Fold an A4 piece of card into a greetings card shape. Cut out a heart- shaped window in the middle of the front of the card. Cut a square window in a second piece of A5 card. Stick the laminator pouch inside the heart window. Then stick the square card window over the edges of the laminator pouch, inside the card. This will neaten the inside. Finally, arrange the cooled hearts and flowers onto the front of the card in wahtever pattern you would like using glue spots or foam pads. Your card is then ready to write. This post is a paid collaboration with Bostik. Every month Bostik send us craft materials in order to bring you a themed craft post. For more crafts, check out our craft category.